The worst programme on television meets Europe's leading radical intellectual. What could go wrong? Not a great deal, as it happens. 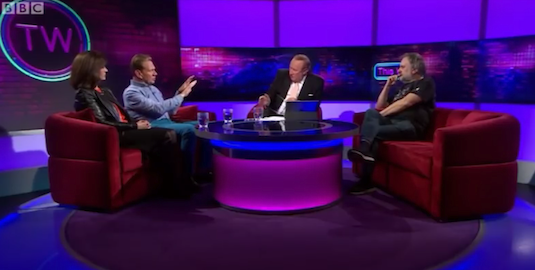 Having Slavoj Žižek on the This Week sofa facing Michael Portillo, Caroline Flint and Brillo certainly helped "raise the level", as we used to say in Socialist Party meetings. The subject? The miserable malaise or, to be more accurate, the abject collapse of European social democracy and rise of the populist/far right. Žižek's argument was that the left hadn't risen to the challenge, and what we're seeing advancing across the world instead is a recrudescence of authoritarian capitalism. America, Russia, Turkey and China were name checked, but he could easily have included the likes of Poland, Hungary, Austria and, yes, Venezuela too. Used to spouting garrulous verbiage at spellbound interviewers, needless to say Brillo had an easy time with Žižek. The first, and entirely reasonable question was why the crisis of capitalism has taken down the left rather than the right. After all, the former are/were rooted in its critique and amelioration while the right are vehicles for the defence of bourgeois class interests. Surely the right should be a bloodied, quivering mess dirtying up the carpet instead of the left. He might be able to turn around wadges of books on Hegel and Lacan at the frequency of tweets, but on this occasion our Slovenian champion of lost causes couldn't provide a coherent answer. Let me offer a suggestion. Social democracy is in crisis not because it neglected its base; it actively hammered it. Greece, France, the Netherlands, Spain, Italy, Germany, even here in the UK the centre left has undergone partial or complete collapse because the core constituencies of these parties have found themselves made to pay for the crisis, bear the brunt of cuts, get thrown out of work, and had tin ears turned to them. If the left are not articulating the grievances people have and, worse, are playing a role stoking them in the first place, millions of people will look elsewhere. On this point, even Caroline Flint showed glimmers of awareness by pinning it down to globalisation. Though, true to form, social democracy should get on the immigration-bashing bandwagon as well to turn things round. Brillo did have a bit of fun at her expense while noting the one centre left party standing above the carnage is our very own Labour Party. Unfortunately, the discussion didn't progress onto whether a similar approach could reverse the fortunes of the left elsewhere. In my view it can, but it cannot simply be declared or imposed from the outside. Remember, less than a few weeks before Jeremy Corbyn got onto the ballot paper the fragments of the far left here did as poorly at the 2015 general election as they did at any other, despite standing on platforms trying to articulate the interests that gave Corbynism life. Similarly in Germany, the SPD are polling worse now than when Hitler let his thugs loose in the compromised 1933 election, and yet Die Linke are not storming ahead. Success has to be bottom up, self-activating, and able to pour through an opportunity afforded by a gap in an existing institution. Only then can its transformation into something else respond to and articulate the inchoate collective will coursing through it. If Labour is any model or a vision of the European left's future, this means rejuvenating its relationship to wider movements and simultaneously present as a serious contender for government. It's not an easy process, and each country has to find their own way to it. But if there is a universal lesson, it is to stop hammering your own. Žižek was sharp enough to acknowledge that it's possible the left won't get its act together, and the new populist authoritarianism (authoritarian populism?) could sweep to power as it has done in the US. This, obviously, should be a focal point for left resistance and might, for some, be a way of touching off the radicalisation and rejuvenation we need to see. We should also avoid the stupidity of supposing that once a Trump screws things up the left will automatically benefit. Žižek then didn't have any prescriptions, suggestions or much in the way of advice, but Corbynism at least represents one of the best kind of answers: those that emerge from the process of struggle, and expression of the collective wisdom of politicised crowds. I don't think the pessimism is justified. Right-wing populism is not actually triumphant everywhere. Its not just Britain where the apparent victory of the right Cameron/Brexit/May led to Corbynism - though here it required an element of luck with JC getting on the ballot. The victory of Trump, especially given the role of the Clinton/Democratic establishment, gave new life to the grass roots movements that arose with Occupy. That is where the real social momentum in the US currently resides. In France Le Pen lost, but the victory of Macron can't be seen as a victory. However, the important point was again the failure of the SP establishment, and rise of Hamon. But it shows that it does require organisation to move forward. Something similar can be seen in the SPD youth wing. These are the future not the old Stalinoid groups like Die Linke or Melonchon. But, there is another factor. The ability of the working-class to move forward is also determined by the state of the economic cycle. Its clear that the hiatus, caused by the 2008 financial crisis, in the new global long wave boom that started in 1999, is resuming. We have the strongest, synchronised growth in the world economy (90% of which is growing above trend) since before 2008. The US yesterday posted more than 300,000 new jobs for February, way, way above trend, and the EU is growing strongly too. The objective conditions with led to the rise of conservatism between the 1980 and 2000, and which got a new lease of life after 2008, are coming to an end, and that undermines the factors that provided a basis for right-wing nationalism. But the left still needs to take advantage of that change of conditions, and to organise, as well as to tackle head on the bigotry that is utilised by the head of the nationalist snake for its own purposes, and not to accommodate to it. It's good to read Zizek's book 'From Tragedy To Farce'. Here he looks at the problems for the left (in general) following the collapse of the international banking system. He argues that the working class has too much to lose to allow the whole capitalist system to grind to a halt and why they inevitably lurch towards authorative solutions rather than seek radical overhaul. He illustrates this using the collapse of the Italian left following the Red Years and the rise of Mussolini. Sharp and well written. Worth a butchers. Socialism has been a disaster for Venezuela so now we define it as...not socialism. Those most keen to define Venezuela are, funnily enough, the Tories. Do you think they're an authority on such things? Did you read what he wrote in The Courage of Hopelessness about the regressive nature of identity politics and "intersectionality" "activism"? I thought it was very timely. When Brexshit, Putin and the orangeman disappoint their supporters, as they inevitably will, there needs to be someone who will actually attend to the issues around lack of good working-class jobs, graduate un- and underemployment, rents, first-time buyers, jobs, the housing crisis, and the environmental issues that have a real & concrete impact on people's lives rather than a load of old cobblers about their "privilege", a concept meaningless to ex-miners from Ball Green. I welcome Zizek's contributions to this debate & hope you will consider the challenges he lays down in this department. How can Venezuela be socialist when most of its economy remains in private hands?